Niche Keywords: What are they and why are they useful to us? Suppose you own digital marketing consulting agency based out of India. Now you rank #1 on Google for those Dream keywords like “digital marketing”. Obviously, the blog will start getting a ton of traffic from people searching for “digital marketing course”, “digital marketing guides”, digital marketing experts (that includes people searching for experts in Europe, USA, new york, Spain all over the world 🙂 ). But is that traffic gonna bring revenue to you?. Perhaps not probably because you are a digital marketing agency in India. And you are bringing traffic to your site that’s looking for stuff like “digital marketing course”, “digital marketing training institute”. “digital marketing experts in Europe”. we need to understand the intent of users. We as search users type in long intent based Niche keywords like “hotels near me” “best hotels in my city” while we are looking to have a meal at a hotel in the afternoon. Obviously, the hotels that rank for such terms or have their search ads targeted for such a term would make good revenue. But what if the contradiction happens? A Brand like a local restaurant ranks for “hotels”. Yeah, obviously a ton of traffic to their business website. But unfortunately, they are not gonna do business with of all those traffic because as I said earlier there will be people searching for “hotels” from all over the globe. Now, with the help of Practical illustration’s let’s try to understand how we can actually pick up those Niche keywords for our business. Niche Keywords are those long tail keywords that are associated with high user intent, user demographics, user location etc. Niche Keywords can also be defined as the smallest possible subset groups of keywords that are exclusively impactful for a business. Take the example of a father searching for a cricket bat for his kid. He would go on and search for key terms like “Cricket bats for Kids”, “Kids Cricket bats near me”, “buy kids cricket bat” “Kids Cricket bat stores in Delhi”…. and so on. If you carefully analyze the first keyword “cricket bat for kids”, here, in this case, the user demographics would be a father searching for a cricket bat for his 9-year-old son for his son’s cricket practice daily evening. Similarly the keyword “buy kids cricket bat” shows that the user is typing in with an intention to buy a cricket bat for is the kid. Following with that the keywords “Kids Cricket bat stores in Delhi” would be best suited for someone who is looking to buy kids cricket bat in Delhi location. You must also test and analyze your Niche Keyword’s monthly search volume, competition, relevance etc. There are various tools like Google Ads Keyword Planner, SEMRush etc that can actually help you get the keywords search volume, competition, relevance, data etc. We will definitely discuss more on keyword research and keyword targeting in future blog posts. But for now, let’s understand how we can actually find Niche Keywords using simple Google Search. Case: A Digital Marketing Training Institute. Now let’s assume there is a Digital Marketing Training Institute based out of India. And this institute relies so much on selling their flagship Digital marketing course to run their business. They approach a digital agency in which you work. Their goal is to get more sales for their course. And your boss has assigned you the task. And your job is to find the best relevant keywords for their Search engine marketing campaigns. 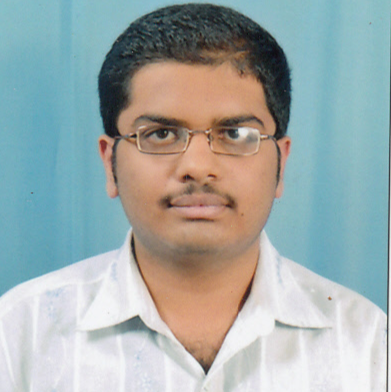 Just type in “Best digital marketing course in India”. And google automatically suggest you a bunch of long tail Niche Keywords for the business. These are the keywords that google suggest on the basis of its machine learning technique. In simple, words google is actually giving you all the data of user queries or user search keywords related to your business. you can copy and paste them in an excel file and export it to google ads to get the keyword data. So, then what is next?. Are You gonna just hang around keywords like “best digital marketing training” for our marketing campaigns.? As I told you earlier Niche keywords are also those smallest subset group of a keyword. So, when we think of a digital marketing training institute there could be so many courses around it. There could be a course on facebook marketing, twitter marketing, search engine marketing, social media marketing, bing ads marketing course, influencer marketing, affiliate marketing and so on. And this is how we go in Niche. And you realize Digital Marketing itself is a Niche & it has a ton of Niche stuff inside it. 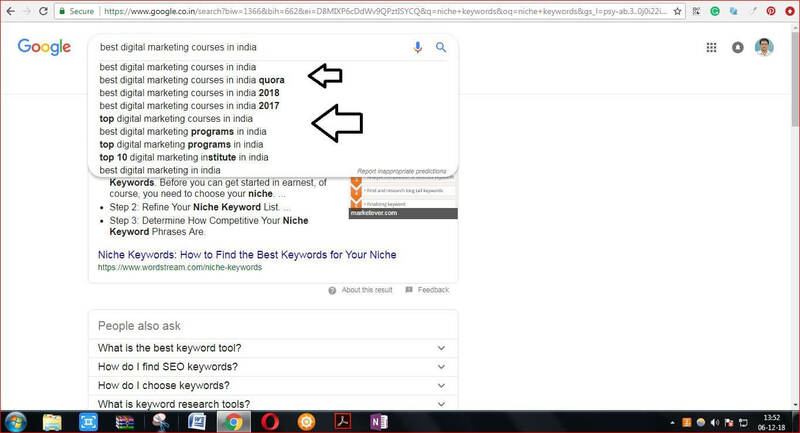 Now you can be thinking of targeting keywords like “facebook marketing course in Delhi”, “google ads training in India”, etc for that marketing campaign that we discussed above. Remember the local vegetarian restaurant example I told you earlier?. It doesn’t have to be that they need to try to rank only for keywords “hotels near me”. 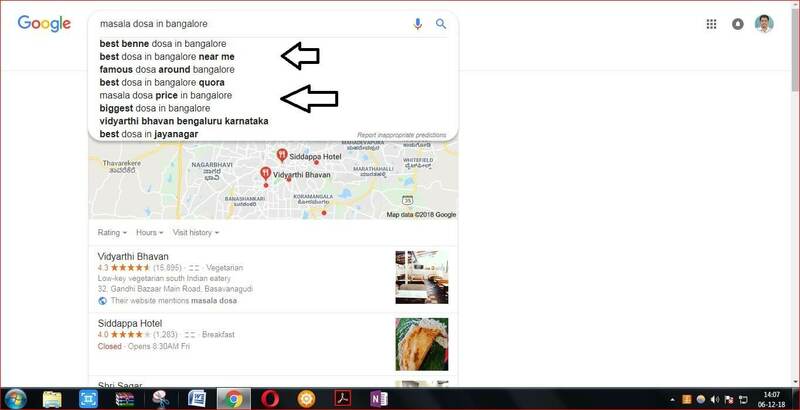 They would be making a lot more business if they think of ranking on Google for search terms like “best benne dosa in Bangalore”, “masala dosa in Bangalore”, etc. Perhaps they could even think of targeting keywords with areas of Bangalore like “best dosa in Jayanagar”. They could end up targeting a lot of people searching for masala dosa, benne dosa in their locality. Ultimately leading to more business for their hotel. In that way, they will have a ton of more highly relevant Niche keywords for their business. And it will ultimately result in highly targeted traffic, high conversions & high revenue for their business. After reading this blog, I hope you got some great ideas on Niche Keywords for your business. If you enjoyed reading this article, Please do share it on Social Media Sites with your friends.